Not ever limited by any one medium or genre, Motoko Kikkawa has been working prolifically with sound, performance, improvisation, drawing, ceramics, textiles, paper, sculpture and photography in Dunedin for over twelve years. Shortsighted Girl's Very Thick Wall takes its cue from Kikkawa’s current interest in creating delicate, small scale drawings with watercolour and ink on paper. For this exhibition, she extends this process to its limits by presenting one large new installation for the Blue Oyster’s main gallery space. 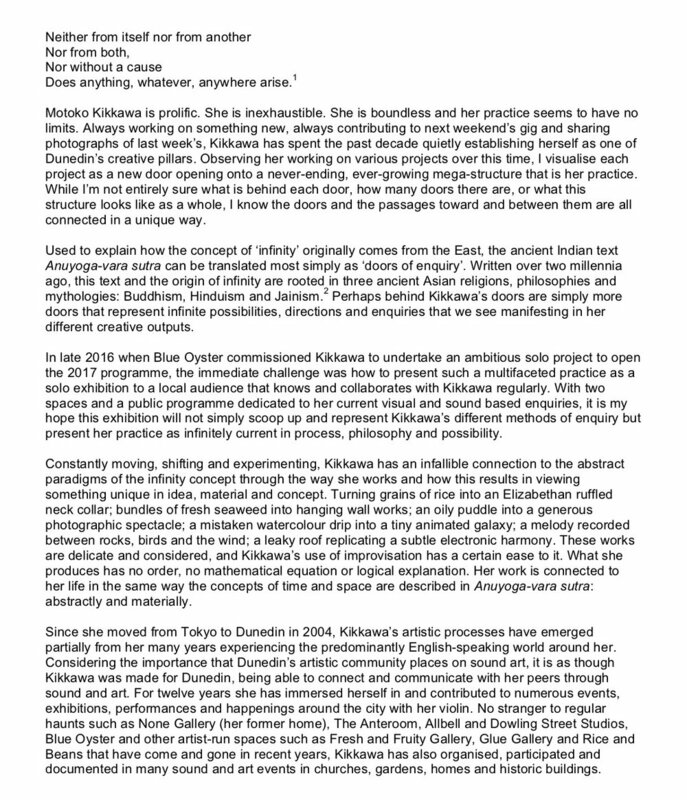 Often referred to informally as one of Dunedin’s hardest working artists, Shortsighted Girl's Very Thick Wall acknowledges Kikkawa’s continual contributions to Dunedin’s local creative community and seeks to define her as one of Dunedin’s most significant experimental practitioners working today. During the exhibition, the second space will reflect this with a rotating schedule of short films and sound works by Kikkawa dating from yesterday back to 2012. Kikkawa’s Blind Jams — one performed at the opening preview and another event later in the exhibition — will also pay tribute to her long relationship with Dunedin sound; inviting six local collaborators to play blindfolded via experimental improvisation.